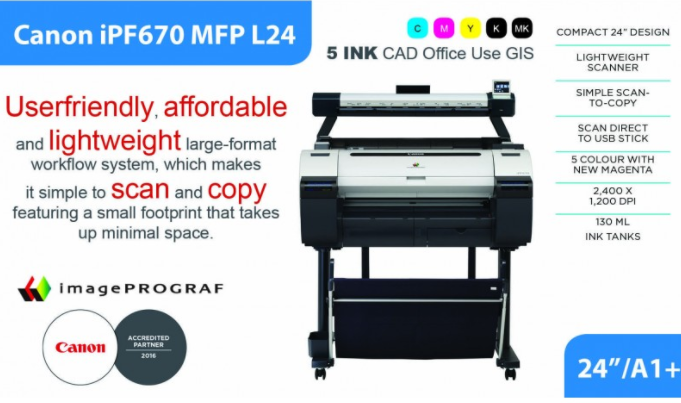 Solution iPF670 L24 MFP is a workflow system that is easy to use, affordable and lightweight in a large format, which makes it easy to scan and copied when a small housing takes up little space. 24 this compact MFP solutions do not require a separate monitor or PC. Printers and scanners for small lightweight integrated into a simple frame only requires little space. MFP solutions designed to simplify all the work process, from document scanning to the end result. The interface is easy to use on a scanner lets you scan and copy without connecting to a PC. You can also navigate easily by changing the various functions and settings. You do the editing by pressing the button on the scanner, such as a panel on the Copier. Everyone could accept it. 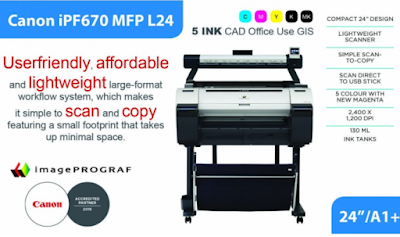 IPF670 MFP L24 was a versatile imaging solution with the ability to scan and copy in one simple operation. You can also scan directly to a USB stick or perform simple scanning and save the workflow. SingleSensor with multi-LED lighting system generates highly accurate scanning with superior quality. When printing, the Canon of dye inkjet system 5 colors produce a sharp and thin lines with an accuracy of +/-0.1% and the minimum line width 0.02 mm. newly developed magenta Ink also covers a broader spectrum than ever before and presents bright colors on the picture of CAD and GIS, and the text red or high quality photos for posters and POS. This entry level MFP solutions designed to meet the demand for small offices and workgroups to the device simple and easy to use. It is ideal for environments such as the Bureau of design, architects, construction companies, educational institutions and processing companies. The easy operation also makes it very suitable for multifunctional Office projects such as creating posters A2 or A1, heading or subject matter. Supported file formats are PDF, JPEG, TIFF and TIFF-G4. Save the file as a TIFF directly into USB sticks or other formats via a special PC software. Power Supply External PSU: Input: 100 - 240V, 50-60Hz,Output: 3.42A at 19V. SCAN 200dpi Draft = 1ips colour, 3ips mono,400dpi Standard = 0.5ips colour, 1.5ips mono,600dpi Best = 0.33ips colour, 1ips mono,Scan to USB,USB2, 128 GB FAT32 recommended. Scan to Network - L Scan App GB Ethernet. L Scan App - Sets scan directory and file type. Minimum PC specification: • Windows 7/8/10.x - 32bit. • Intel Celeron, Core-Duo, Core-2-Duo or 2.8GHz Hyper-Threading (HT) or AMD Dual-Core processors • 2GB RAM • High speed 7,200rpm Serial ATA (SATA) HDD with minimum 2GB for applications and 20GB free for images. Suggested PC specification: • Windows 7/8/10.x - 64bit. • Intel i3,i5 or i7 processors • 4GB RAM • SATA 6.0Gbit/sec USB3 on the motherboard and SATA 6.0Gbit 7,200 rpm HDD controller. Security Unique scanner model is only supported by L Scan App. Scanning cannot be started remotely. Modes Scan to USB - RGB/Greyscale/BW, TIFF,Scan to Network - RGB/Greyscale/BW, Tiff, Jpeg, PDF, TiffG4,Copy - RGB/Greyscale/BW,Cloud connectivity is achieved by using Canon’s Direct Print & Share as a separate process. Same for PRINT. However, the step-by-step of the installation (and vice versa), it can be differed depend upon the platform or device that you use for the installation of Canon imagePROGRAF iPF670 MFP L24.The above mentioned, the installation is occurred using Windows 7 and Mac for windows XP or windows 8 is not much different way.